The prospect of ‘no deal’ on Brexit has been making headlines, with the Department for International Trade recently outlining its plans, said to include unilaterally dropping all food tariffs, for that scenario. In addition, Brexit Secretary David Davis appeared to suggest both the UK and EU parliaments might not get the opportunity to vote on a Brexit deal done in the ‘59th minute of the 11th hour’ – the upshot of which might then be no deal at all. So a new analysis of three Brexit scenarios by AHDB makes for timely and thought-provoking reading, as one of its main conclusions is ‘high-performing’ farms are far better placed to cope with changes post-Brexit than their less efficient counterparts. This, says the report, should focus attention on farmers knowing their relative performance and on pursuing practical ways of improving output and containing costs. In other words we are back to benchmarking and the vexed question of why more farmers do not make use of it. 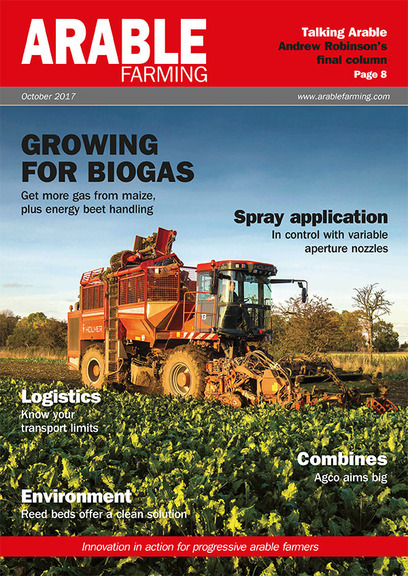 Arguments for and against are regularly and vociferously voiced, but can it really be the case large numbers of UK arable farmers are prepared to shun a tool which could improve their business’ performance and safeguard its future? Red 24 and Dark Green 37 may sound like something from a sci-fi movie but they are the latest yellow rust and potato blight pathogens identified in the UK. We should take heed; the presence of Red 24 has already led to a major revision of Recommended List winter wheat disease ratings, while the emergence of Dark Green 37, with resistance to blight fungicide fluazinam, will force a rethink of blight control programmes next spring. Frustratingly, the uncertainty over glyphosate continues. As I write, an EU decision on the chemical’s future has been postponed again as too few member states were willing to vote in favour of a 10-year renewal of its approval. The vote fell short of the majority needed, with Germany and Portugal abstaining, France voting against and 16 countries, including the UK, voting in favour. These issues, and more besides, will be hotly debated at the CropTec Show at the end of November. Don’t miss our preview this issue and be sure to register for your free ticket. We look forward to seeing you there. Previous: What are the three key challenges to the poultry sector?